Measurement traceability system is provide guidelines for approval of methods, process monitoring and control on measurement. Which is require for traceability, calibration, testing of measuring instrument, and measuring devices. The system provide reference standards to easier for conduct calibration, measurements and tracking each device concern calibration process. Which through communicate with all the department for calibration and measurement processes. To ensure that their use produces material are accurate. Manage equipment as per range and accuracy. It may help to maintain consistent results to ultimate final product assurance of quality concern. To maintain product to meet end application requirements. The general purpose of measurement treacebility system is to provide guidelines to people about measurement requirements, and improvement of quality by manage measurement equipment. This system can apply to all product quality and internal system requirements. Where requirements cover measurements and use of each measuring instrument, equipment and device. At all the level and places which directly related to product quality and supporting processes. Measurement traceability system process is important for quality and laboratory management. Quality manager is responsible for preparation, maintain and update measurement traceability system procedure. Also for establish proper monitoring system, controlling system with proper follow up. Quality manager is responsible, to ensure that the each process is conducting properly in the system. All the peoples of company are shall responsible to conduct proper process for calibration and use of equipment for various purposes. That is measuring for quality testing and inspection. Quality manager monitoring on each activities of measurement & calibration concern activities. To establishment / determine proper controls to manage quality system at the level of requirements. General manager is responsible for ensuring that the all measuring and monitoring devices’s calibrated as per calibration standards. It may also ensure that the each employee using proper method and procedure for measuring any product or process. In case of any gap found during the observation, manager will be gives training to these employees. Measurement equipment accuracy is maintained according to standards system adopted by management. The measurement traceability system’s prime requirements is measurement equipment accuracy. That is used to continuous tracking system of measurement equipment, measurement instruments as per standards system. The calibration system are established to traceable required standards are helpful to determine equipment accuracy. The standards references are used to maintain measurement equipment accuracy. In order to maintain accuracy in manufacturing processes. Requirements of measurement equipment in the work within the started work scope. Only appropriate equipment / instrument or device should be used and made continuously available. The measurement equipment, measurement instrument and measurement devices appropriateness are determine by requirements of internal measurement requirements. Calibration system, Process requirements and environment. Types of measurements are needs to conduct. The equipment / instrument requirements are manage as per range of measurement expectation of works. That defined or required for product or standards and its accuracy and precision is important that determine as per calibration system. The measurement equipment stability and capability are considered. To perform under the existing environmental conditions setup by management and government requirements. Document that help to determine measurement traceability awareness for various processes and measurement equipment used in various processes. 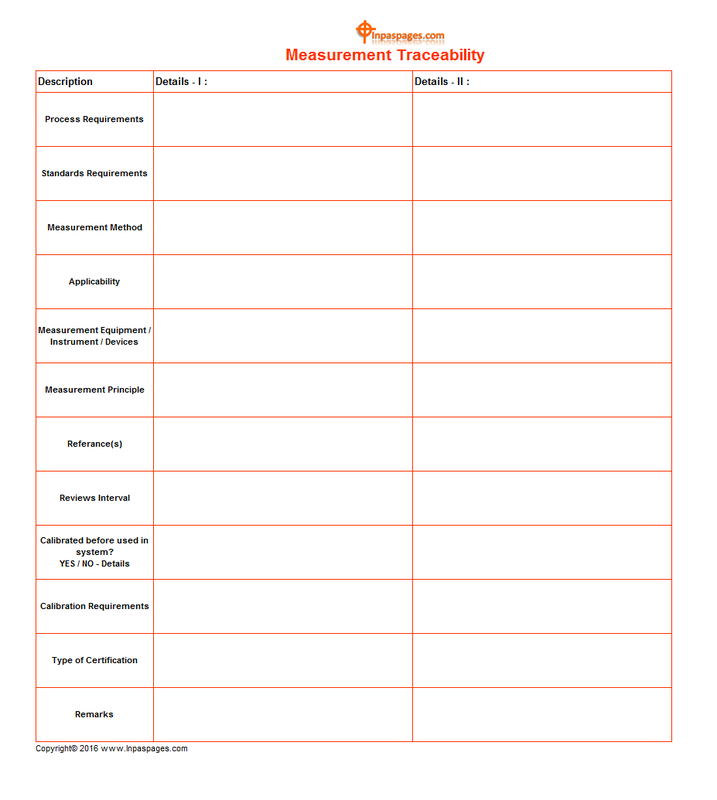 Measurement traceability format given as above, to help for determine measurement traceability. These format may help to meet internal process requirements of the measurements & calibration. Normally it should be needs to comply product standards, and measurement standards. Measuring equipment / measuring instruments and measuring devices. Which has been suitable calibrate as per standards system. These measurement devices should be store at secure locations / storage divisions. Where its all accuracy and suitability for use for maintained throughout the period. The location where measurement equipment are storage. That should be proper secure and locked / open authority should assigned by management. The records for the measurement equipment, measurement instrument. Measurement devices are description of the standards methods and standards procedures. These procedures are use for maintain quality measurement system during handling materials. At the end of all the activities, quality manager will update all related documents and records.